Karate America Appleton East/Darboy Birthday Parties offer parents the perfect birthday solution. Parties are great for current members and non-members alike. We ensure that all participants have an awesome time, get some great exercise, and enjoy an exciting Karate practice. Our facilities are well equipped with matted workout floors which allow for exciting indoor games and offer the perfect surface for Karate practice. In addition, parents and kids love our rock climbing wall and "club" style rockin' light show and sound system. Perhaps the best part of our parties is that we handle almost the whole event...while parents relax. Parties are 1.5 hours, and our staff leads the entire party with structured fun for everyone. With our innovative games and exciting Karate instruction everyone is sure to enjoy the party. After games and Karate it is time for cake, gift opening and celebration. It's a great solution for an important day. Spaces are limited and are often booked months in advance, so it's best to reserve your spot very early. PARTY SLOTS ARE VERY LIMITED AND BOOK MONTHS IN ADVANCE. CALL OR VISIT TODAY TO RESERVE YOUR SPOT. 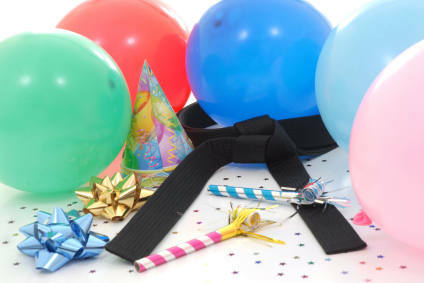 For more information on Birthday Party Hosting, contact Karate America by Clicking Here.